Topaz is the birthstone for those born in November, and the astrological birthstone for those born under the zodiac sign of Sagittarius (November 21 – December 21) – the alternative gemstone for November is Citrine. 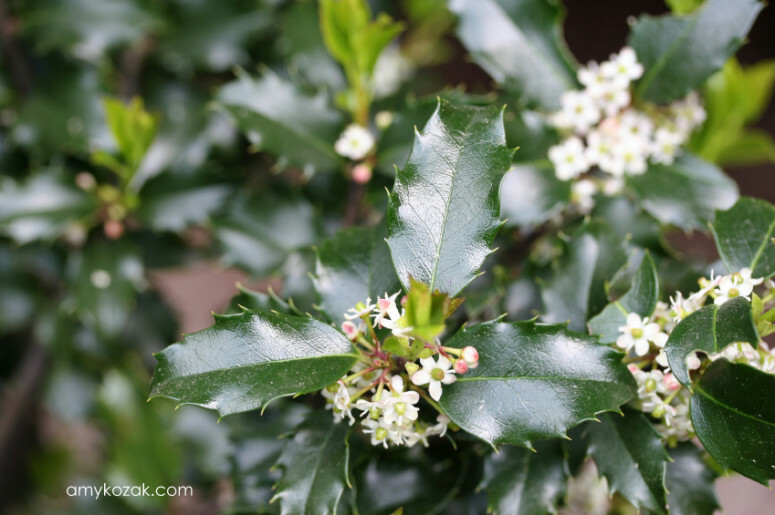 Did you know there are also flowers associated with birth months? 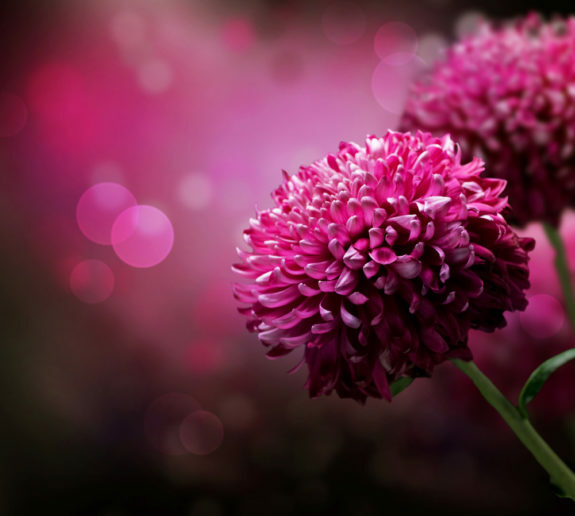 The flower for November is the Chrysanthemum – love all the gorgeous colors of these flowers! The name Topaz was derived from island formerly Topazos (now Zabargad – which is also known as St. John’s Island, located in the Red Sea in Southern Egypt). 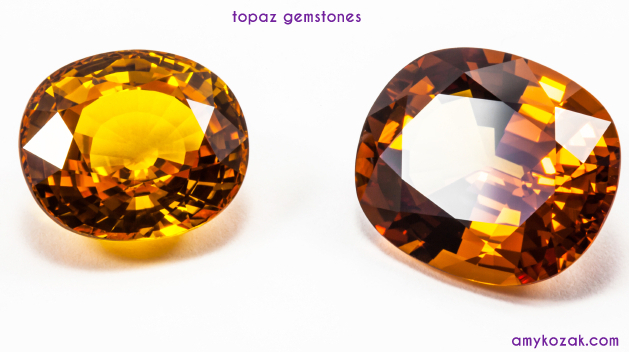 Topaz is related to the Sanskrit word ‘tapas or tapaz’ meaning “heat” or “fire”. Natural pure topaz is colorless but due to impurities/minerals within the stone – a multitude of colors can result. 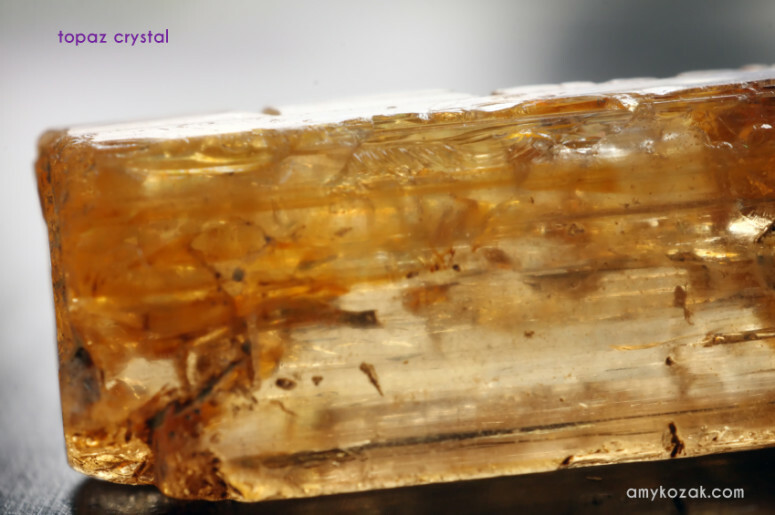 Topaz can be found in yellow, brown, orange, green, pink, red and blue – the last three colors listed are the most rare. 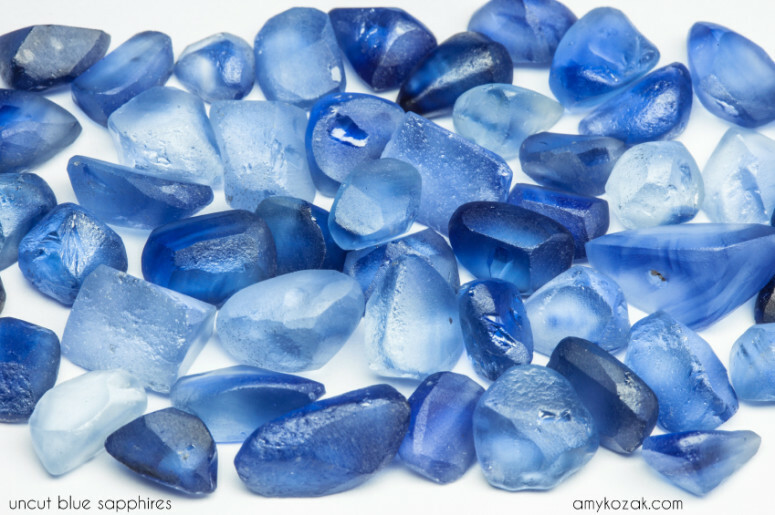 Folklore is abundant in the gemstone Topaz. Egyptians believed Topaz came from their sun god Ra, granting them protection against harm. Topaz has an inner radiance and is believed to strengthen one’s intellect, success, and courage. This stunning gem is also thought to deter sadness and prevent bad dreams. Citrine – an alternative birthstone for the month of November – is part of a group of minerals from the quartz family. These include amethyst, aventurine, prasiolite, and tiger’s eye. The name is derived from the French word ‘citrin’, meaning lemon – this yellow color comes from the gem’s iron content. Natural citrines are quite rare – most commercial stones you find today are actually heat-treated amethyst gemstones. Citrine is thought to promote success, generosity, and abundance. 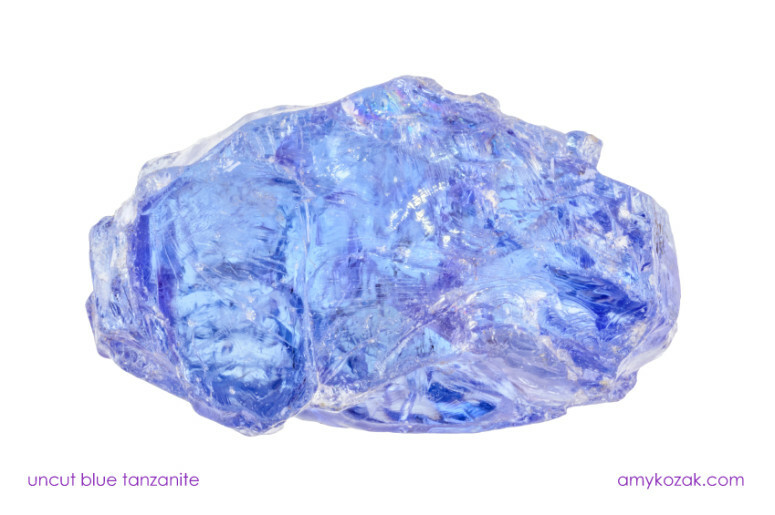 This radiant gem is also believed to increase personal power and energy, decrease self-doubt and negative energy. By enhancing mental clarity and confidence, Citrine increases one’s creativity and honesty, which in turn can yield success and abundance for the individual wearer. True love beneath the topaz that she wears. It’s a quarter to midnight. You stand between the wide-open french doors of your beachfront villa. You inhale the sea breeze and listen to the crashing waves below as they dance in the moonlight. Where is he taking me to dinner this late at night? 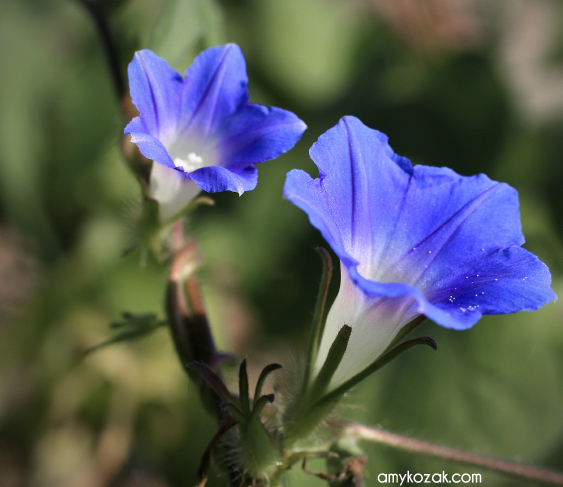 You wonder… your long, cream-colored, chiffon dress moves with the air. It’s a moment you’ll remember forever. 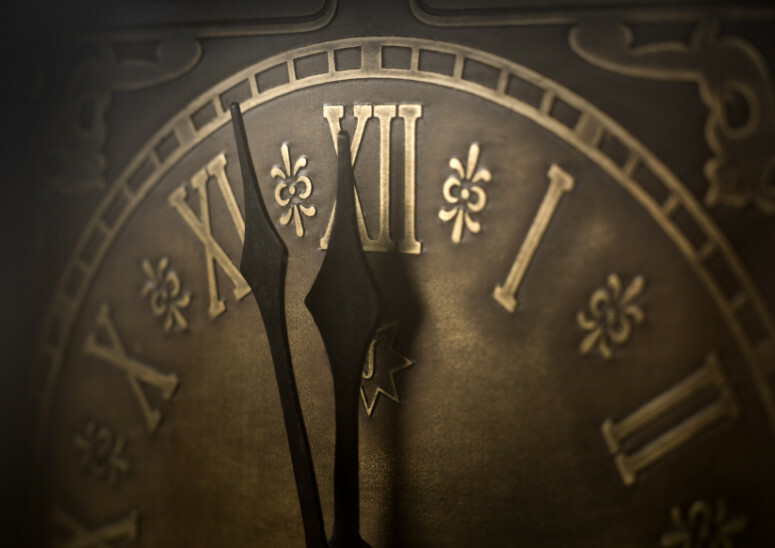 You’re almost ready for the planned 11:59 p.m. departure, but not quite. You walk up to your vanity. It’s filled beautifully with lipsticks, bobby pins, and adorably tiny perfume bottles. But you know exactly what you’re looking for. You pick up the velvet pouch, unfold it carefully, and pull out your serene, blue, chalcedony earrings. As you hold them in the air to let them glow, the vanity light makes the briolettes dazzle next to the gleaming gold that holds them. 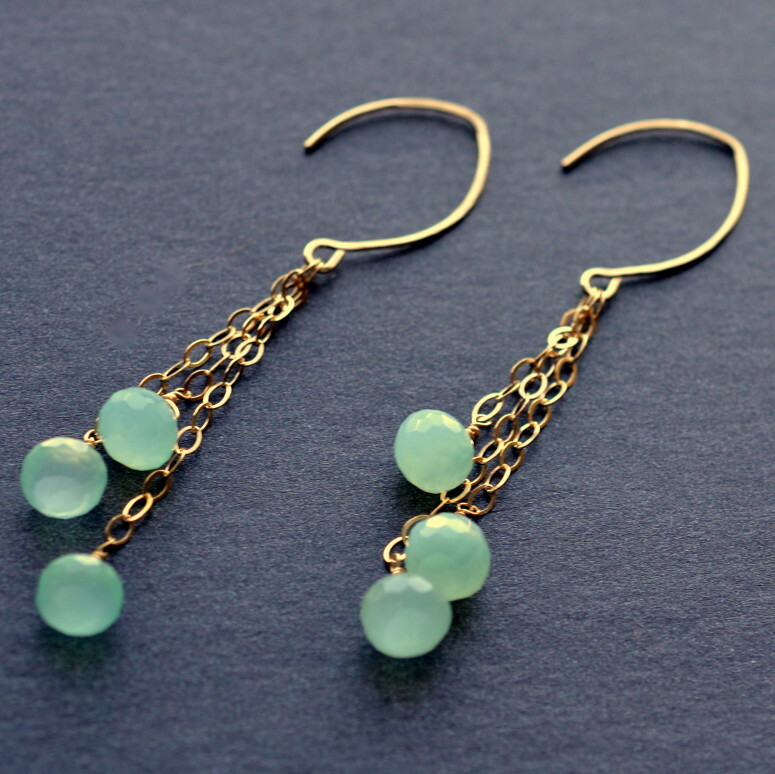 Chalcedony is known to increase vitality, emotional balance, charity, and friendship. What a magical night this could be. You slip on each earring, look at yourself in the mirror, and smile. October birthdays unite – this is your post! Opal is the birthstone for those born in August, and the astrological birthstone for those born under the zodiac sign of Scorpio. (Tourmaline is an alternative natal stone). The Curious Lore of Precious Gemstones by George Frederick Kunz, mentions the gemstone beryl (fyi – emerald is a beryl, as is aquamarine) as the natal or birth stone for October – but since we already went over emeralds back in May; and aquamarines in March, we will stick to the more modern traditions of birthstones in this post – opal and tourmaline. 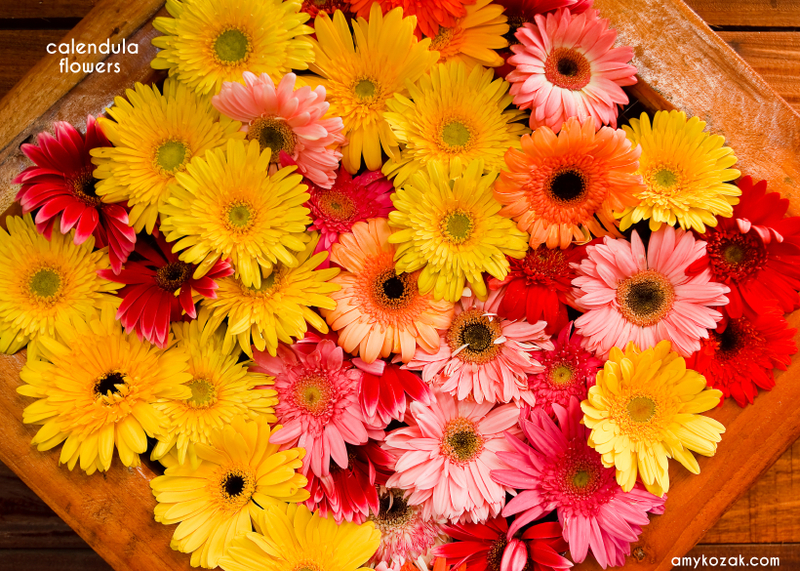 However, further research finds the more traditional birth flower for October to be the calendula – a species of herbaceous plants that also includes marigolds. I am going to begin with the opal – a delicate gemstone that can be found in a variety of colors. Opals display a rainbow of colors depending on which angle you view them and many varieties exist. The word ‘opal’ comes from the Greek word opallios meaning “color change”; derived from the Sanskrit word upala meaning precious stone. The opal is a delicate gem which plays into its bad rep. Opals are soft (between 5.5 and 6.5 on the Moh’s hardness scale – for comparison, diamond is the hardest gem – at 10) – meaning these stones are easily scratched. Given that a common component of household dust is quartz (moh’s scale 7) – merely cleaning your opal jewelry can scratch your opal stones. Did you know that opals also contain water – usually about 5 to 6%. 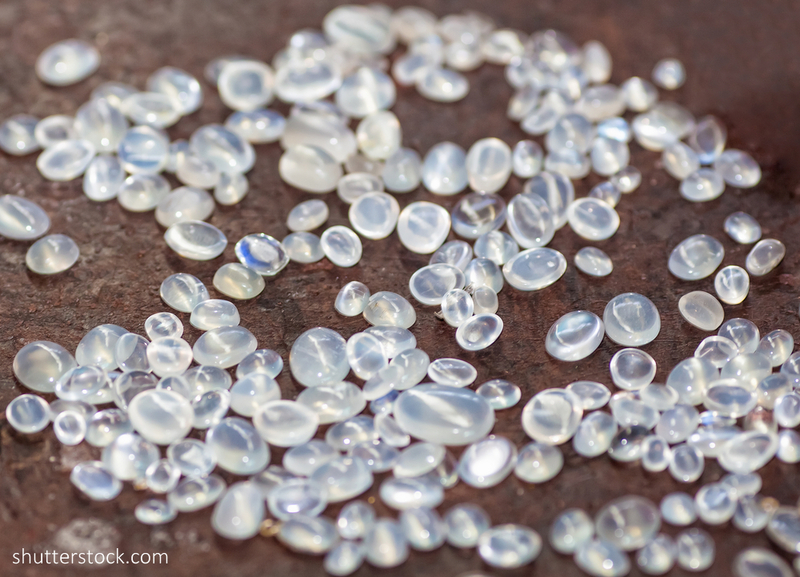 If you have ever had an opal from your jewelry collection crack, this characteristic water component could be the culprit. Opals are also sensitive to sudden changes in temperature. 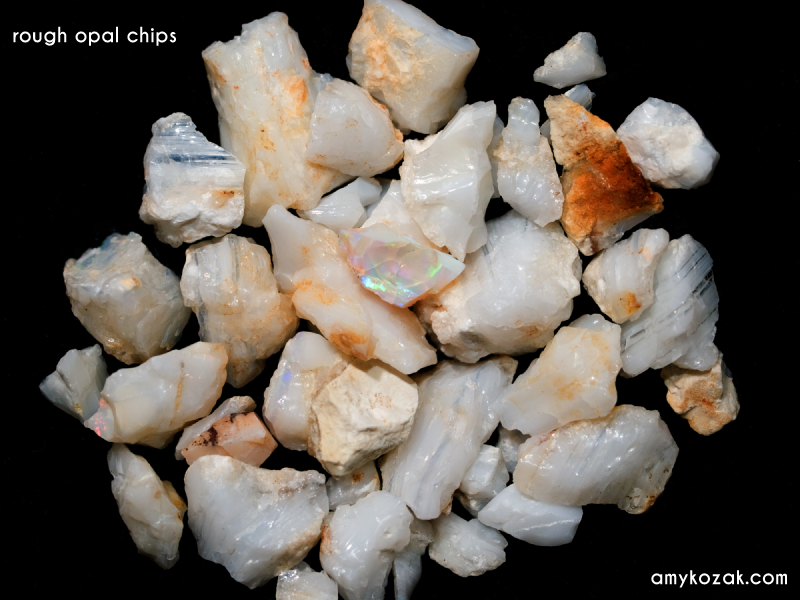 In low humidity environments or dry climates, opals can dry out and crack. You can take extra care for these delicate stones by storing your opals in a plastic bag with a damp cloth to prevent drying out, and cleaning them with a soft cloth. The opal is believed to be a symbol of hope and purity, as well as protection form the ‘evil eye’. It provides the wearer with luck and enhanced vision, and is believed to comprise all the virtues of each gemstone whose color was represented in the color spectrum of the opal. Next up – Tourmaline. The name tourmaline comes from the Sinhalese term toramalli – meaning “crystal” or “false diamond”. 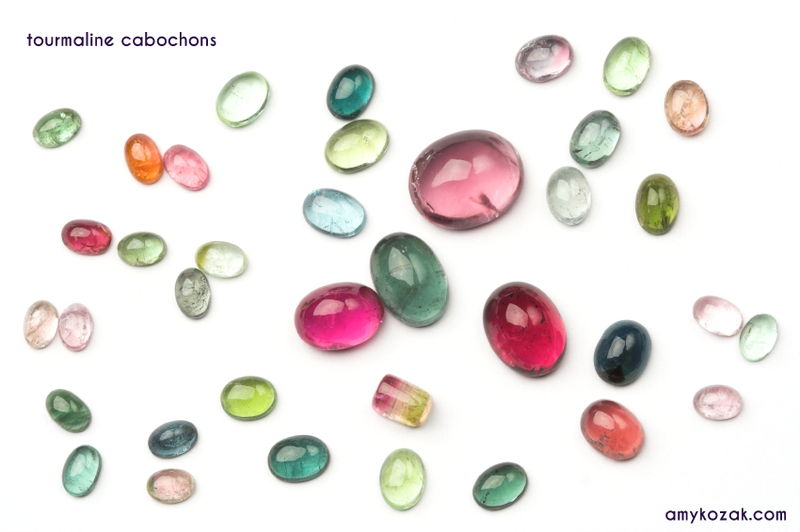 Tourmaline gemstones are available in many colors – pink, green, blue…and the list goes on. 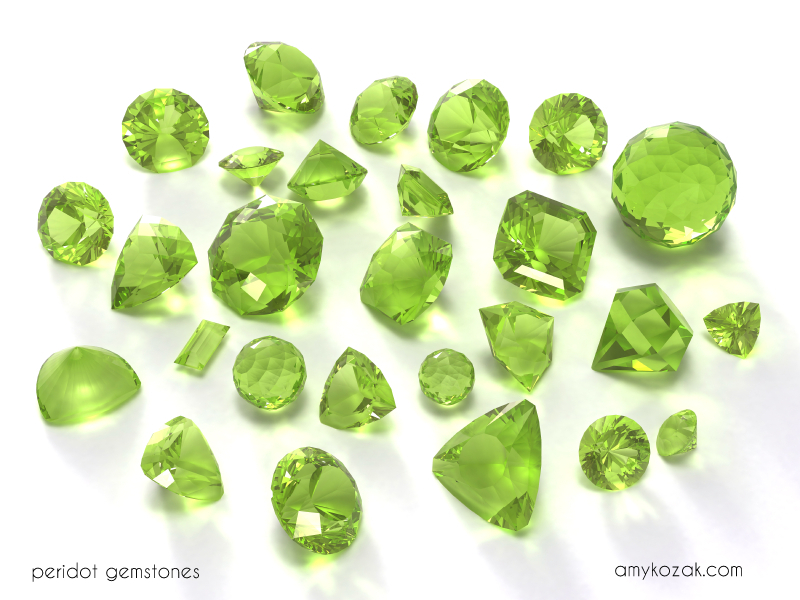 Gemstone folklore describes tourmaline as a tool to bring insight and intuition. Known for providing the wearer enlightenment, tourmaline also can be worn as a talisman to protect against danger. Tourmaline is also thought to inspire creativity, and strengthen the body and spirit. No longer need she fear misfortune’s peril. What do you think of the folklore and superstition behind opals? Do you wear opal gemstones? Let me know in the comments below! Ever been to the gem show?? 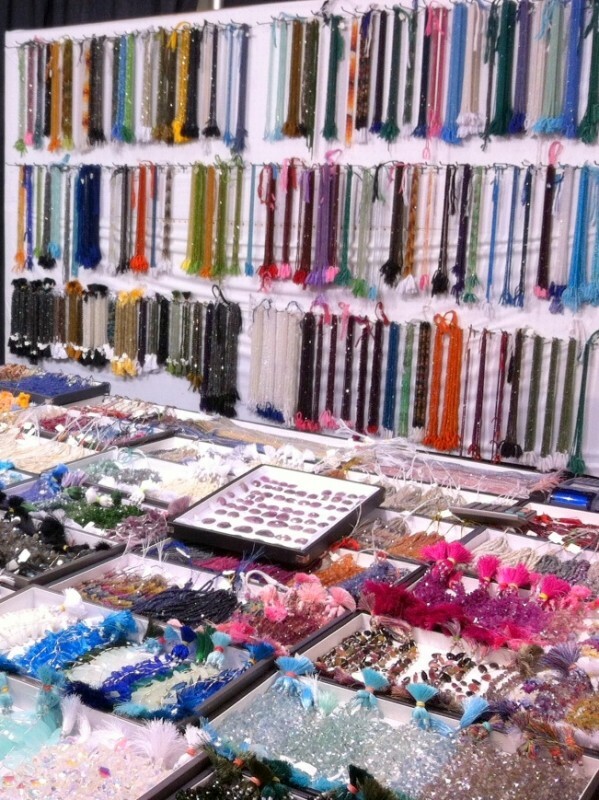 Several times a year Intergem holds their multi-vendor shows at different convention center locations across the US – if you love gems and jewelry – this needs to go on your to-do list right now! These shows have a variety of vendors – mainly jewelry and watches, and jewelry supplies; but you can also find scarf and accessory vendors, sunglasses and a variety of other things on any given day. Intergem hosts a retail section as well as wholesale. The wholesale section is where I run like a crazy lady head to so I can check in with my favorite stone suppliers and see what new sparkling beauties (along with my standard favorites) they have. I have to prep myself before I go in, because as soon as I catch a glimspe of the all the stones…I turn into a squealing little girl in a candy shop – seriously – the only thing that gets me more excited than the gem show is when someone brings me chocolate! See what I mean – all these photos were taken at ONE table – and, there are hundreds of vendors at this show – each table more tempting than the next! I have a few gem suppliers that I go to each time – I love catching up with them and hearing about their travels with the gem show. The next gem show here in the DC area is at National Harbor in November. It is a smaller venue with less vendors, but I love heading to National Harbor for the gem show, and then having lunch at one of the many great restaurants there. Rosa Mexicano is one of my favorites – they make your guacamole fresh right at your table – yummy!!!! 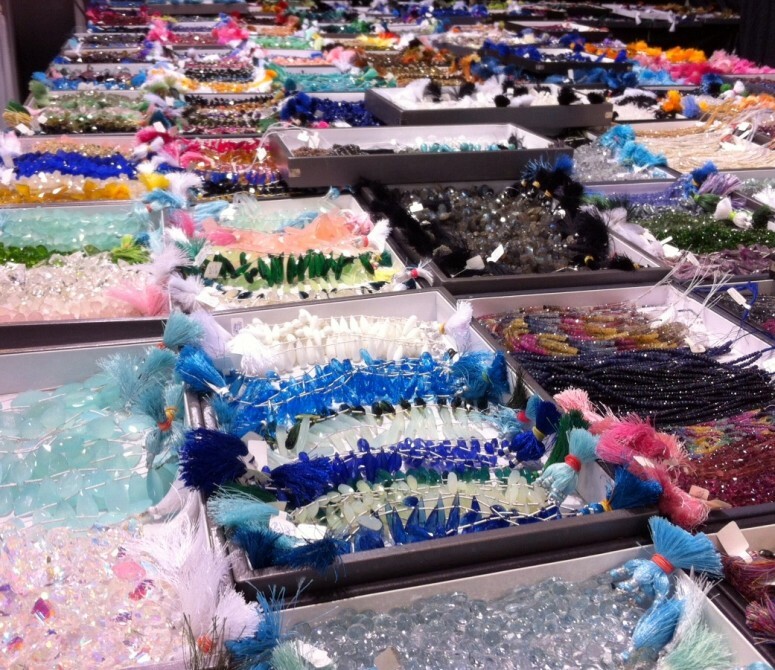 So there you have it – a peek into the gem show. 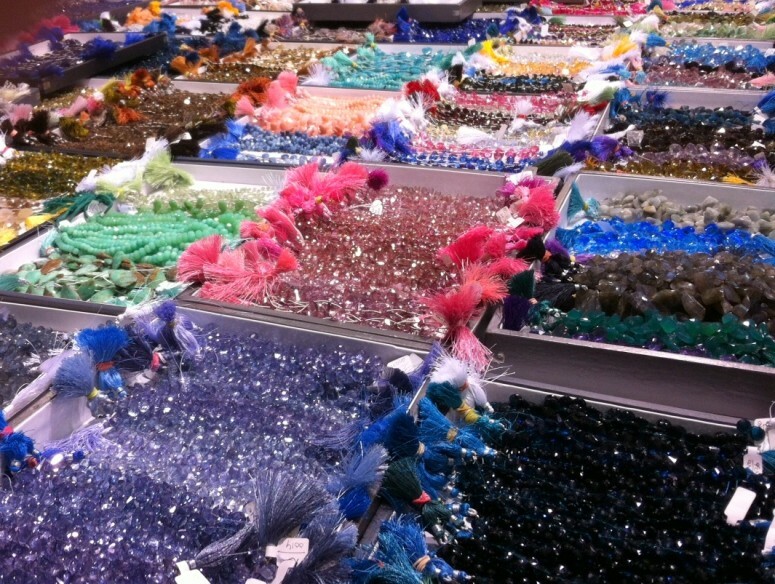 Will you be heading to a gem show soon? 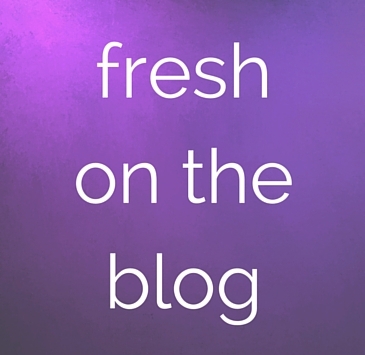 https://amykozak.com/wp-content/uploads/2015/09/gemshopping1.jpg 788 940 Amy http://amykozak.com/wp-content/uploads/2016/08/emblemlogo.png Amy2015-09-08 00:40:232016-05-18 20:48:44Gem Shopping Anyone? As I mentioned last month, we have four birthstones associated with this month – pearl, alexandrite, moonstone, and agate. Before we get into the 4 gemstones for month of June, let’s start with the other basics. The astrological birthstone for those born this month falls under the zodiac sign of Cancer. 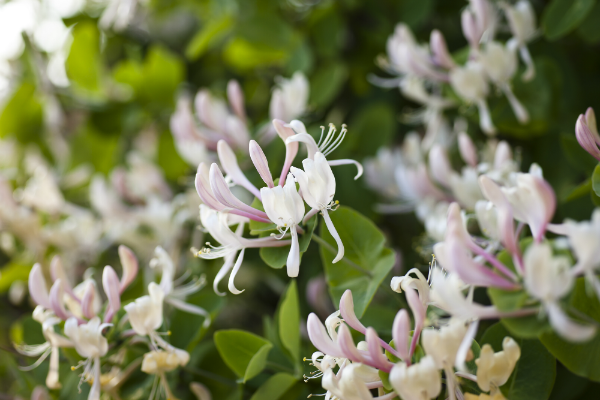 The flower for those born in June is the honeysuckle. Pearls begin to form in oysters when a foreign substance gets inside the oyster’s shell – so they differ from all other gemstones & minerals due to their organic origin (vs being embedded in rock). Just like our own bodies mounting a repair/attack on invading substances, the oyster starts its own attack on this foreign matter that has become an unwelcome guest inside of the oyster’s shell. The oyster begins its attack by covering the unwelcome guest with layers of the same substance used to create its own hard shell – a substance called nacre. Over time, layer after layer of nacre, a lustrous pearl is formed. 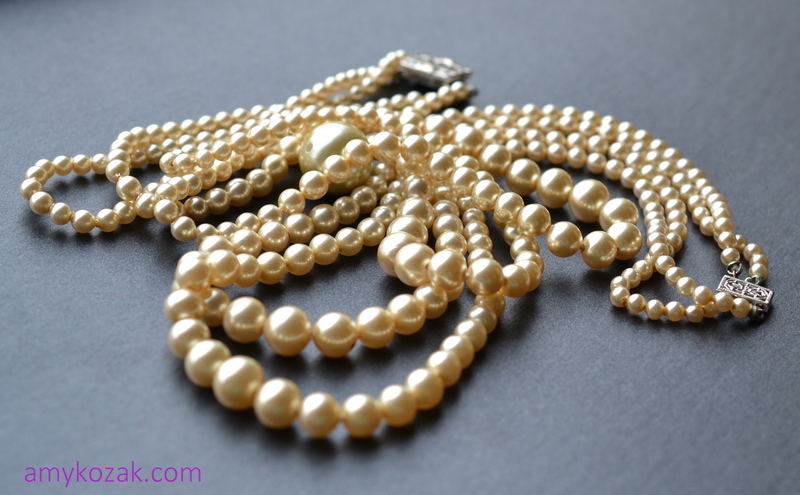 In ancient times, pearls were thought to come down from heaven into the sea. Early Chinese myths told of pearls falling from the sky when dragons fought (who knew?!?). Pearls symbolize wealth, power, and longevity as well as purity, generosity, love, and integrity. Alexandrite has chameleon-like personality. In daylight, it appears as a beautiful green color, possibly with a bluish cast or a brownish tint. However, under artificial lighting, the stone turns reddish-violet or violet. Alexandrite was discovered in 1839 on the birthday of Prince Alexander of Russia – in an emerald mine in the Ural Mountains of Russia – and the stone was subsequently named after him. A dream of alexandrite was once thought to signify the approach of hard times. 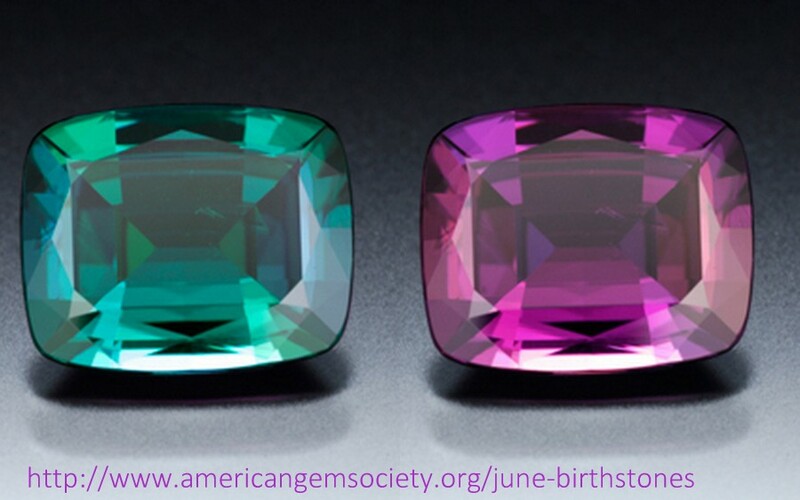 It is believed that when an Alexandrite gemstone is worn close to the heart, it will bring love, energy, and harmony. Alexandrite is also thought to impart wisdom and creativity, as well as strengthen an individual’s insight. The moonstone is believed to bring good fortune, victory, health, and wisdom to those who wear it. 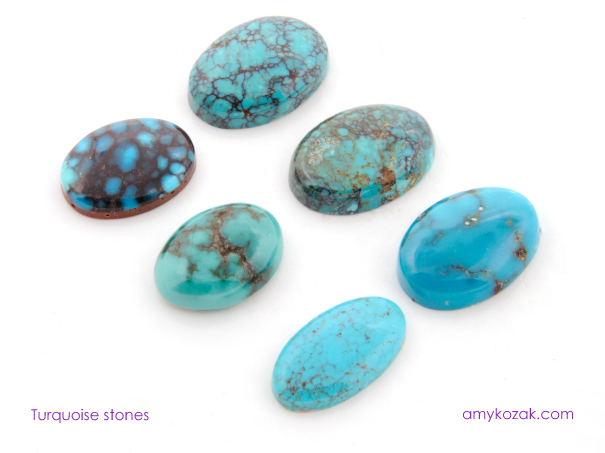 These stones show off an array of colorful light – a bluish-white sheen – when under different light sources. Moonstone is also thought to enhance intuition, and is associated with mystery, magic, and dreams. Many believe the moonstone to be associated with the moon. During a full moon, the moonstone’s power reaches its peak – so it is said to be especially powerful at this time to reunite lovers, heal the wearer, and promote inner emotional healing. And now, for the grand finale – Agate. Agate is shown in one of my books to be the birthstone for June, although its mention in other birthstone lists for this month is missing. 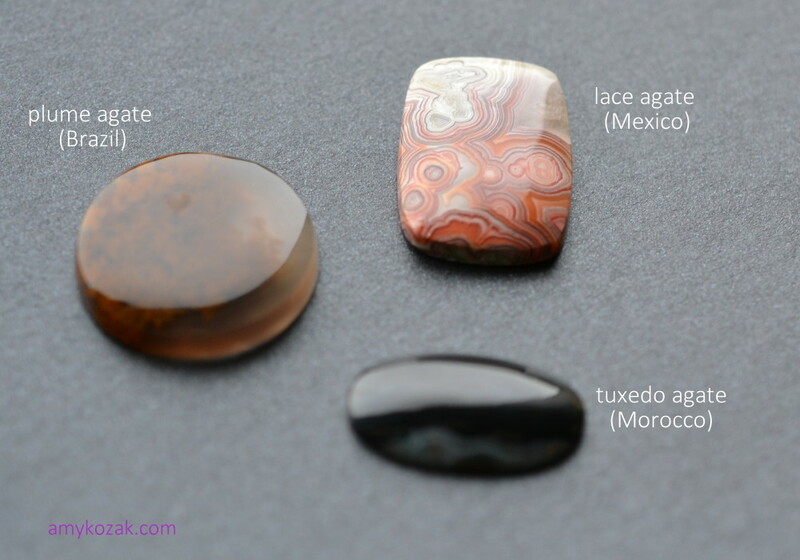 Formed from layers of quartz which usually show varicolored bands, agate usually occurs as rounded nodules or veins. It is a more common stone and has many varieties of color/striations – some more common names include moss agate, lace agate; and plume agate. Agate is thought to improve memory, perception, and concentration, and encourage honesty. 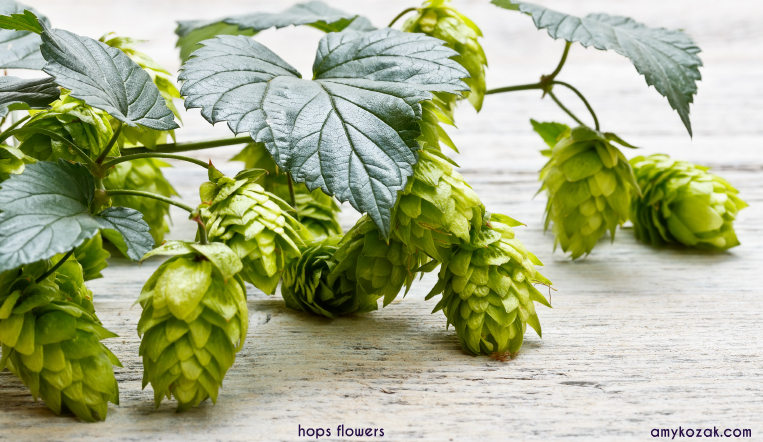 It is also thought to provide a calming influence, and will also enhance creativity, strengthen the intellect, and offer protection from harm. So there you have it for this month’s big party of birthstones – whew – I need some chocolate after that! can health, long life, and wealth command. Ne’er see June’s sunshine turn to tears. So we went through more stones than normal this month – did you find a favorite? Let me know in the comments below!